As someone who worked on the State Farm account for a few years, I view the company’s latest concept with more than a casual interest. The company with the familiar “Like a good neighbor…” jingle is about to launch an entirely new retail idea smack dab in the middle of my neighborhood in Lakeview. And at least at a first glance, I think they’re on to something good that more in the insurance industry might want to take a closer look at doing themselves. State Farm Next Door opens August 1st and the concept is a more open, casual community space that offers free Wi-Fi and coffee (via its Next Door Cafe) as well as personalized coaching/small group classes on financial matters that range from paying off student loans to learning how to budget your finances. The "Good Neighbor" with a new look. This may not seem like a huge departure from the typical agent office, but it is. Here’s why. For a long time, State Farm talked about the fact that their agents live in the same community as their customers. Which is normal. But even though you can continuously say, “We live where you live,” there’s nothing quite like actually demonstrating it visibly by being more of a central hub. Plus, there will be no actual insurance sold at State Farm Next Door so they aren’t cannibalizing their own agents’ efforts by selling policies here. There will be financial consultants and all the services at Next Door are free. Personally, I think the latter part of that sentence is important for bringing down some barriers among younger people who would normally walk on by because they don’t see the point in planning when they don’t even have the funds to pay for ongoing classes. Stepping out of the “Auto/Home/Life” rate rut. Let’s be honest. You first walk into or call State Farm, Allstate, Farmer’s, etc. because you have a need for auto, home or life insurance. You need to get covered, you compare rates, you buy. You don’t like your rate after a while? You look around, you compare again, you buy. Fighting a branding battle based on rates doesn’t benefit State Farm. I never thought it has. It’s territory that Geico and Progressive have owned quite well for years. Even when State Farm talks about the dangers of “cut-rate car insurance,” they’re still planting the seed of shopping based on rates and playing into the hands of their competitors. That’s why, even though the newest ad work for State Farm is entertaining, that’s not necessarily what I see pulling people in. 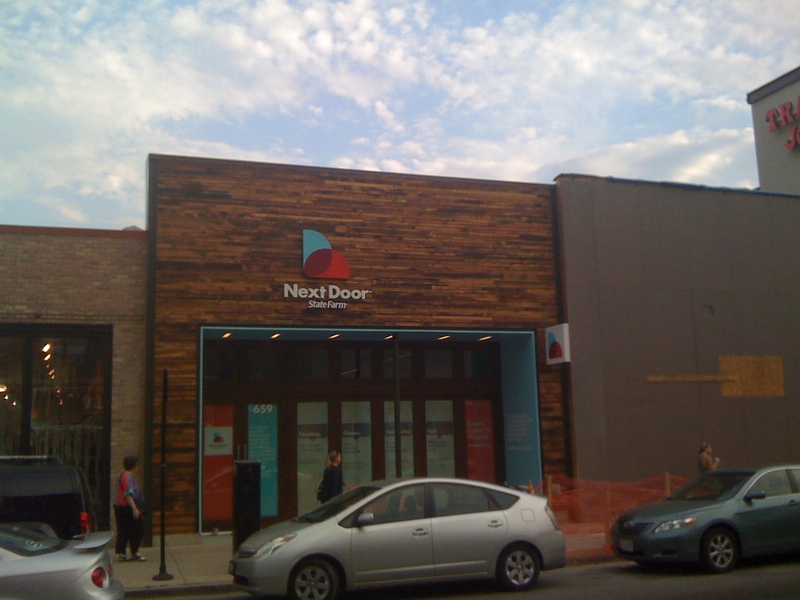 I see the Next Door concept having real upside by broadening out from buckets of insurance sold from an agent behind a desk into more generalized classes on finance and budgeting for 20-somethings and 30-somethings in the neighborhood who needed that guidance but couldn’t find it up to this point. You don’t have to walk into Next Door with an intent to buy. You walk in with an intent to learn (sorry, I don’t think I’ll walk in with an intent to just have a cup of coffee when there’s Starbucks and Caribou close by, but I appreciate the offer). In a way, State Farm’s Next Door feels a lot like smart social media itself – not a hard sell but a place to inform a community. And possibly learn from it along the way. I also like the fact that State Farm has the guts to do a true departure design-wise (different logo, wood background) for this sub-brand of Next Door, because in this case anything that looks too close to the familiar auto/home/life color palette would be a bit of a turn-off. A bright red building would scream “State Farm,” but it wouldn’t say “come in with your financial questions or just to hang out.” The location doesn’t hurt being steps away from Trader Joe’s and the Diversey/Clark/Broadway intersection. Does this type of cafe concept with free classes, coffee, Wi-Fi and “no strings attached” appeal to you from a financial services and insurance company? As many of us in Chicagoland who grew up in primarily a Jewel and Dominick’s world, it’s easy for me to have comfort with both of these grocery store brand names. Yet, I’m ready to step outside of that comfort zone thanks to what Trader Joe’s has brought to the table. And I’m not just talking about food. I’m a big proponent of building the brand from within – not with only terrific products/services, but a culture that is aligned with that brand and in turn results in better customer experiences. The store oozes an unparalleled happiness from the moment you walk through the door. Here are people over a wide range of ages who seem to be genuinely enjoying working in their environment and helping people. The walls are bright and painted with several mantras (“Great wine shouldn’t mean expensive wine”) as if they were coming from the founder himself. As part of a promotion, we walked out with a brightly colored Trader Joe’s bag that we’ll not only be able to re-use over and over again, but a walking advertisement to be seen all over the neighborhood (further building credibility). Some employees have Hawaiian print shirts, others have colorful and fun t-shirts. At least 3 of them asked me if I needed help finding what I was looking for. The kicker for me is an extensively written newsletter that goes into rich detail about the featured products – contrast this with the typical flyer that just shows pictures of food and pricing. Yes, perhaps you could get something close to this kind of experience at another store. But do you? Every time you walk through the door? Is it even clean half the time? I realize some of the elements of service described above are the “sizzle.” The “steak” is the product itself – you fully expect the stuff to be overpriced across the board as gourmet items often are. But surprisingly, these items are reasonably priced and a good value for the quality in return. Heck, I don’t mind saying that sometimes you don’t mind putting a $3 bottle of Charles Shaw in your bag – in times like these, you just feel smarter for getting decent quality. And where it seems most stores are almost embarrassed to have a wine like that on the shelf, Joe’s puts it out in the open, in the center of the aisle, with the price boldly seen. I know, I know. I sound like a paid spokesperson – trust me, I’m not on the payroll. My point is this: Think about how the Trader Joe’s culture template can be adapted to work for your company. And just because this is a business-to-consumer audience, don’t mistake this for thinking that you can’t make it work for professional services either. Start with your product/service – is it of exceptional quality? Let’s say that it is. Think about what you believe in relation to what you’re delivering and why you do it better than anyone else. Knowing this: How do you wrap that identity around your environment? Are there colors on the wall that speak to your creativity or brand identity? How do your people answer the phone? Are there mantras that everybody can say by heart? If I talked to 10 of your clients, would they say the same kind of praise about you – and are you absolutely certain of that? Are you giving them outlets to provide feedback to you in multiple ways? If there were/are more than one location of your business, how easy is this to replicate? Some dismiss these other elements beyond the product or service itself as just “nice to haves” rather than something being so essential to the brand. Maybe that’s why they provide a good service, but there’s still something missing that keeps them from being a great culture and as a result, a great brand. For example, do you feel a disconnect between departments? Are there people who think their department is the heart and soul of the company rather than part of the team? This is akin to people in one department of the grocery store dressing differently than the others and providing a different level of service that’s inconsistent with the other departments. That’s not a different department – that’s pretty much a different company within the company. And that you don’t need when you’re trying to convey a united front. An environment like Trader Joe’s doesn’t happen overnight. But when you start with a vision and brand strategy that operations later aligns with, you begin to have the makings of a brand that feels real. Genuine. With loyal employees who don’t need special incentives to be great ambassadors on your behalf. This isn’t a mere theory. There’s a whole lot of people living and breathing it – see for yourself. On Diversey and probably just about every other Trader Joe’s location in the country.